I'm not big on landmark dates and it's only by accident that I realized that it's just about the second anniversary of this blog. It will be almost for awhile because I started in on February 29, 2008. There will be no 02.29 this year. Or next. So I guess that it's today or nothing. When I began this I thought that it would be more writing than art, and would probably be more about birds and nature than about art. But I knew that I wanted art in the title because it would inevitably make an appearance. I was happy to discover that there are a wealth of people writing well about both birds and nature on the web. Many of them have more experience, more passion, more interest than I do. I have all of them just not so much as many others. And I also realized I didn't like much of the bird and wildlife art I saw on the web. Maybe I could do some wildlife art that I liked. Since I've spent far more of my life with art than with nature the blog has headed off in that direction. 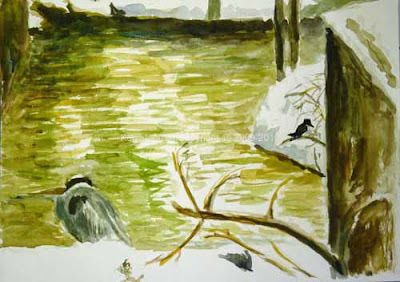 Birds and nature are still the subject of the art but art itself has gained prominence. I'm happy with that. It's where my talents lie. I'm including one photo here. 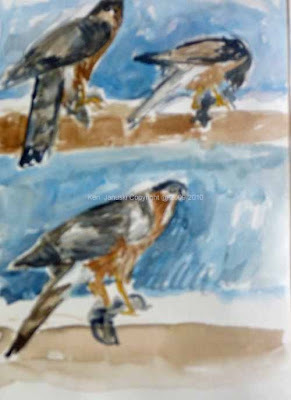 It's a synopsis of the last two posts, various studies and the finished drawing that came about from seeing the Cooper's Hawk on Friday. It shows to an extent how I work: try one medium, then maybe another, maybe back to the first, until eventually I feel like I've portrayed the subject in the way that I want. A year ago I probably would have tried one medium or two at best for a particular subject. Now I'll thry three or four. In time I might add oil paint. But I think this is the way art works best. You keep trying until you get it the way you want. Part of this is that I'm devoting more time to art. 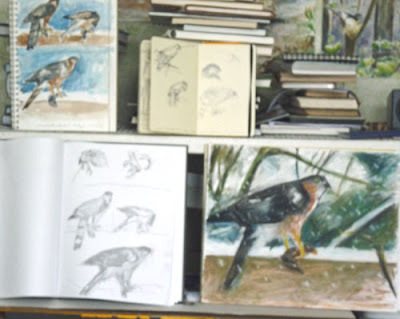 Much of this I'm sure is due to the fine example set by the artists of the Wildlife Art section of birdforum.net. Seeing such high quality work on a daily basis has been a great stimulus. And I'm sure that part of it too is due to my readers. I never really thought much about them/you when I started this. But I have enjoyed all the readers, both the anonymous ones whose name I'll never know as well as those who comment with some regularity. An artists toughest and most important critic is always himself. But it's nice to know that there are some other people enjoying what he or she does as well. 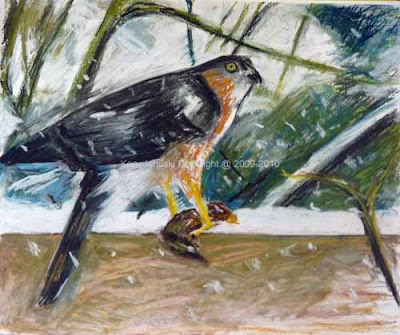 I think I neglected to mention yseterday that when the Cooper's Hawk took his prey it was snowing very hard. And it was windy, almost blizzard-like. I thought I'd like to get that into the drawing or painting but realized that would have to be the last touch. Given all the trouble I had getting the hawk right I couldn't be thinking about embellishments like snow. Like the parsley garnish without the main entree. 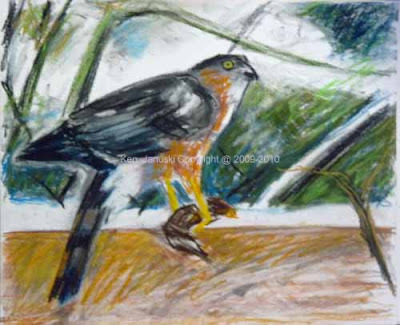 In any case this morning I continued work on the pastel and I'm satisified with the hawk. Once I got to that point I decided to do something to try to indicate the blizzard-like conditions. I'm normally unconvinced by attempts to indicate snow or rain but I couldn't resist giving it a try! I'm happy with it. It reminds me of a quote I ran across by the artist Raymond Ching in the book 'Wildlife Painting' by Susan Rayfield: '"What I want to do is paint a picture that will make you feel the way I felt.". This does that and I can't expect too much more than that. I should add that tomorrow is the second anniversary of this blog. I'm not sure whether I'll post or not but if not I think this drawing and quote are an apt second-anniversary post. The drawing portrays what I felt and this post talks about that as the main goal of art. Apt enough! were nothing compared to the bird that this Cooper's Hawk caught and ate in our backyard today during the middle of Snowstorm # 4. I fear it was a Robin. It was larger than the House Sparrows and I saw a yellow bill. But maybe luck was with the Robin and instead it is one of our many Starlings. I've never been someone who's biased in favor of hawks when it comes to the bird-eat-bird world. Yes it is part of nature and it is perfectly natural. Hawks do have to eat and we're always happy to see them. But we do have favorite birds and both I and my wife would prefer that the hawks not eat them. I admit this is strictly a human bias, but it is mine nonetheless. I suppose the bias is even stronger when you see a hawk methodically tear apart his prey. If you live in the city and don't count human activity you really don't see all that much of 'nature bloody in tooth and claw.' Of course it goes on all around us, certainly with insects and with birds eating insects. But a warbler taking a small caterpillar takes all of two or three seconds. 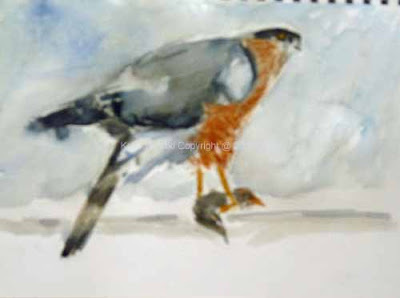 A hawk taking a robin or pigeon easily takes fifteen minutes. So 'nature bloody in tooth and claw' is on display for a good long time. The one good aspect of this is that there's plenty of time to sketch and shoot photos. I did both this morning. And that's where MY trial and tribulation comes in. After I did the few quick fieldsketches at top I decided to see if I couldn't get a more developed work using the sketches and the photos. I really wanted to get the sense of the hawk curved over its prey, concentrating on tearing it apart. Sounds easy. Between the sketches and the photos I had high hopes. But I hated everything I did. It didn't capture the way that the hawk curved his body over its prey, very intent on his meal. The watercolors looked horrible - not exact, with runny, muddy colors. And sometimes the proportions were just totally off, as in the quick watercolor below. I also realized that the photos just weren't detailed enough. I really couldn't get a good look at the bill,among other things. So I flipped through the pages of a book I have on birds of prey and drew the bill and feet from a photo in that. Then I did a few more sketches from my own photos. But I wasn't pleased with my drawings either. In particular the pose of the hawk hunkered over its prey always looked wrong. Finally I started on a larger charcoal and pastel. The most current version is at the top. I use charcoal in such a way that it often exudes a lot of energy. That seemed fitting for the scene. It can also capture both frustration (mine) and action (the hawks). The way I use it, charcoal also lends itself to going over the contours of the shapes over and over until they seem right. I knew I'd need to do that. 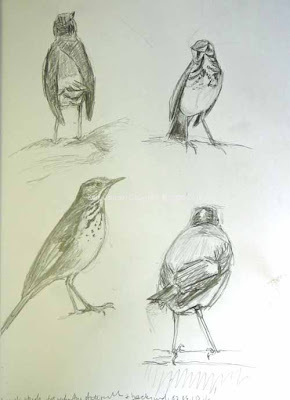 Though I did these sketches of a Great-crested Flycatcher late yesterday afternoon they seem more appropriate for a bright morning as it is right now in Philadelphia. We often see them, as we did this bird, in the early morning at Shenandoah National Park in spring. Their pale lemon breast is an early-morning color, like sun filtered through early morning fog and mist. All in all I think their colors may be the most elegant of all the birds in eastern America, or at least the Northeast. There is the pale lemon yellow breast, the steel blue face, the brownish back and wings and then, to cap it off, the mahogany-cinammon tail. A masterpiece of understated coloristic elegance. And one day they'll appear again. Both morning and late afternoon light seem stronger, like spring is actually on its way. 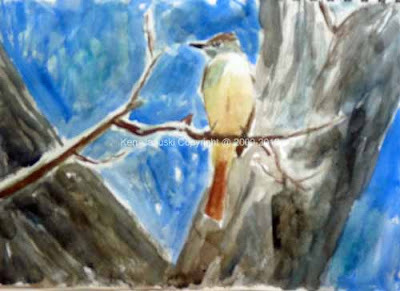 Though I love this flycatcher I've never painted or drawn one. The main reason is that I've just never been able to see enough details in my photos and I don't want a vague generalization. So yesterday I decided to at least make drawings from the photos I had. This bird sat outside our cabin in Shenandoah last spring, just long enough for me to get some photos. My thought was that if I drew at least what I had that eventually I'd get a better idea of the structure of this bird, then maybe use that as the basis for a painting or maybe charcoal drawing. It hasn't just yet. But it might. 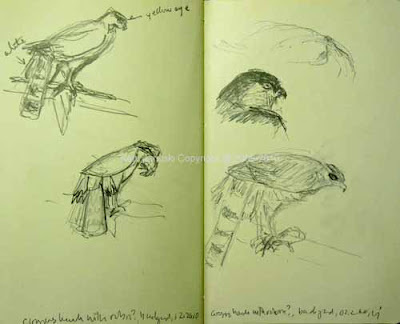 I enjoyed drawing the various postures of this beautiful bird. I rarely draw a bird just to draw a bird. 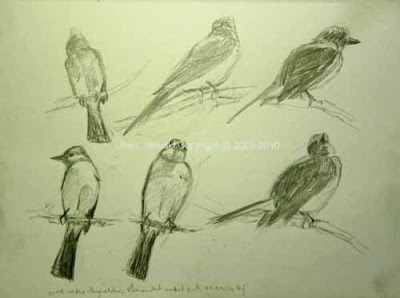 Most often there's something of the bird that I want to capture in paint, charcoal, pencil or pastel. I've always wanted to capture the colors of the Great-crested Flycatcher. Now I have some interesting postures as well. Those two may just be the needed impetus. Well I guess that they were an impetus. After I posted this I decided to do some watercolor studies to see if they might form the basis of a painting or pastel. The watercolor at the top is the first study. It seems like a long time since I've written about improvisation in art, a popular theme of mine for awhile. In the past I've mentioned it in relation to my abstract art which had always been improvisatory. It was something I missed in my representational work. Today I was reminded of exactly what I mean by improvisatory. 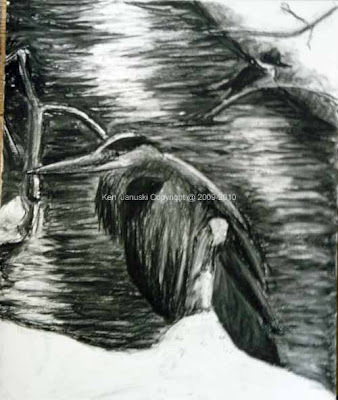 I realized that I didn't know what to do with this charcoal drawing of the Great Blue Heron and Belted Kingfisher that I saw yesterday. I would only know what to do once I put some marks down. In other words the drawing develops in reaction to what is already there. But I can't start reacting until I put something down. So in a sense what I put down to begin with isn't that important. Make sense? I hope so. I think I've always known this but it hit me over the head today when I realized that I really wouldn't know what I wanted to do until I did something! This style of charcoal drawing lends itself to that much more than watercolor does. It's difficult to react to what you've put down in watercolor and not end up with mud. Work that looks bright and fresh in watercolor seems to require planning. Improvisation is just hard in watercolor. There's an element of difficulty in charcoal in the sense that once you really rub in the charcoal it's hard to get the white of the paper back. But other than that it's a pretty improvisatory medium. In any case I've been wanting to do some more improvisatory work for awhile. This is the first. I'm not sure if it's done. Sometimes you just need to let something sit and see if it still looks right 24 hours later. For now it's done. It does continue with yesterday's goal of combining the heron and kingfisher that I saw yesterday into one drawing. They were very close to one another. But not so close as to end up together in one drawing or painting unless they were just small blobs. They were never as close as in this drawing. That juxtaposition is an artistic liberty. Improvisation and liberty in one drawing. Sounds like a good game plan! I always look forward to Cornell Laboratory of Ornithology's annual Great Backyard Bird Count. It always occurs in February and forces us into some winter birding. I like to go all 4 days of the Friday-Monday time period but the 48 inches of snow have complicated things. It's difficult enough to just get to work and buy groceries. So I didn't get out on Friday. Today we did our errands early though so we went out for two hours. Normally we go the Wissahickon. But to have done so today we'd have given up our parking place, which would surely be gone when we returned and forced another lengthy hunt, and we might have had trouble parking at the Wisshickon. So we decided to walk instead. We're fortunate to be in the middle of one of the 10 largest cities in the U.S. and still have two bodies of water less than a mile away. To the northeast is the Wissahickon Creek. To the southwest the Schuylkill River, and a small towpath that parallels it. The walk to the Schuylkill is a steep climb down and back. But that's what we took today, slippery, icy slopes and all. It reminds me of why I like the GBBC so much. You get out in an unusual time of year and see your own neighborhood in a new light. 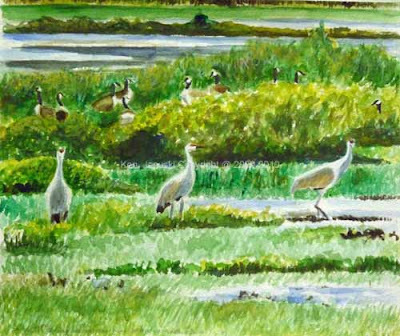 We were shocked to see 19 species, including a Sharp-shinned Hawk, Swamp Sparrows, a Fox Sparrow, a Red-tailed Hawk, and the subjects of this painting, a Great Blue Heron and a Belted Kingfisher. We've seen both before on the GBBC but I thought there was no way we'd see a Belted Kingfisher. I figured the huge amount of snow we've had this year would force them further south. But no, right there on the Manayunk Canal towpath, just as we were ending our trip and heading back uphill we saw the heron, then the kingfisher. In the same place we saw our first Downy Woodpecker, Canada Geese and Mallards. It was too cold to sketch so I just took some quick photos. The accompanying watercolor is a composite. The heron and kingfisher were never so close together. But I wanted to get them both in the same picture. This compositional freedom is something that I did all the time in my abstract work. But this is the first time I've done it on such a large scale in a representational work. Most representational artists will probably be shocked at this. It's a basic tool of the trade. But I've never felt comfortable enough with birds, or landscape for that matter, to stray far from what I actually saw, particularly if I'm using a photo. But that is very limiting. I celebrated the GBBC today by taking that step. 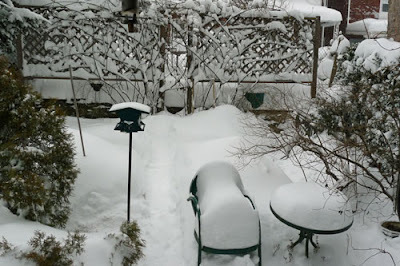 Well I don't think anyone is making any official estimates yet but my guess is that at least in our part of Philadelphia we've gotten about 48 inches of snow over the last 5 days. Today we both stayed home from work due to 'blizzard warnings.' I'm not sure I've ever even seen a blizzard warning in my 25+ years here. Blizzards occur in Chicago, where I used to live, or Ithaca, where I also used to live, but not in Philadelphia. I've forgotten what snow and winter really are due to my 25 years here. But no more. This is real snow! I don't think I've ever shown food on this blog before, and unless you can squeeze the wild yeasts of sourdough bread into the nature category food isn't really art, birds or nature. Sourdough needs to be fed in order to be used for baking. So you can't just say: hey I'll make some sourdough bread today! You need to feed your starter for a day or two. I had been doing that and it was ready today. And I was home all day. So time to make some sourdough bread. In this case I decided to make foccaccia, loosely based on the recipe in my bible of sourdough baking, "Nancy Silverton's Breads from the La Brea Bakery." The day many years ago when I decided to buy that book and learn to make sourdough bread was a life-changing experience. It took about 2 weeks to nurture my first starter so that it was strong enough to make bread. That was probably 10 years ago or so. Since then every winter is the time for sourdough bread. 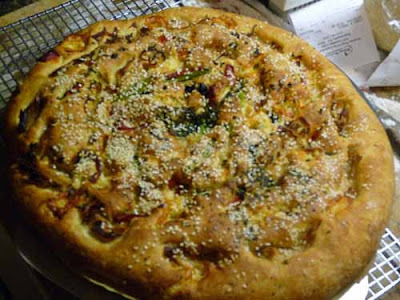 But today I wanted to do something special: not just bread but foccaccia. Our cupboards are a bit bare so smoked turkey replaced anchovies, and cheddar cheese replaced Parmesan. Leftover broccoli raab, the last of some oil-cured olives and a lot of sesame seeds topped it off. A beautiful bread for the day of a blizzard. 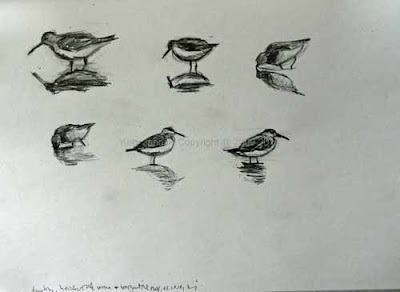 Earlier in the day I worked on some dunlin sketches. 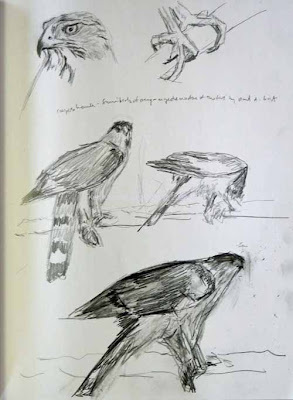 I did live field sketches of these same birds at Bringantine NWR last October. But I had tremendous trouble with the slant of the bill in those sketches. Today I attempted to get a better sense of the bill and their overall structure. This is an exercise in learning as much as it is in art. 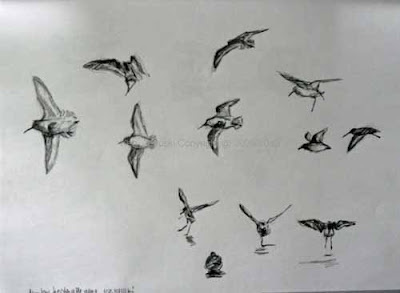 Finally I turned to books by Charles Tunnicliffe, Eric Ennion and Roger Tory Peterson so see how the experts handled dunlins. 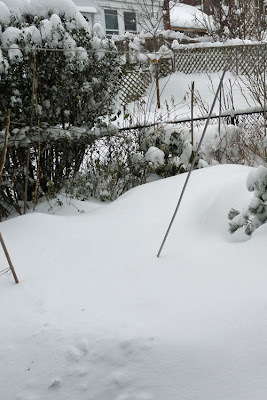 Finally a few photos of the snow. 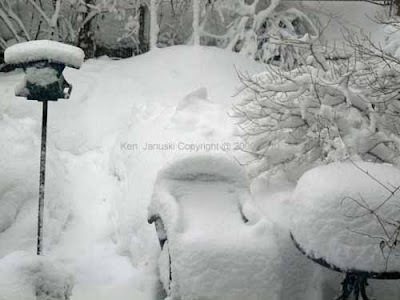 Just last weekend I posted a photo of our back yard and the snow on the lawn chair. Now the snow on the chair is almost twice as high and you almost can't see the chair! Needless to say our birds are having a very hard time. The strong wind and snow instantly cover any food put on the ground and the feeders only hold so many birds. Hopefully tomorrow will bring better weather for the birds. As for us I'm sure it's going to be one long, slow drive into work, if I can find the car in the snow. The area in which I live has a long history of hermits. Streets are named Hermit. The name came from a German Pietist group that settled along the Wissahickon Creek, a frequent subject of this blog, in the late 1600s. But the hermits I'm talking about are Hermit Thrushes, the only thrush, outside of robins, that is possible to be seen at this time of year in this area. We don't see them often in winter here but have occasionally. However they are often one of the first birds of spring. We saw a number of them last April and I posted about it here. I did a few very quick sketches last April but this weekend I wanted to do some more detailed studies. So the accompanying photos show two sketchbook pages and one watercolor sketch. They include birds seen at Fort Washington State Park and in our backyard on the same day last April. There is also one seen at Horicon Marsh last fall. My purpose in these, as in my doodles on Mozart's birthday, is both to get a better understanding of the subject, and to let my imagination work in the background thinking about a more finished work. I didn't come up with any ideas but I'm sure I will at some time. You can probably see that some of these sketches are just off. I could have cropped the photos to just show the good sections. But I think it's more useful to show everything. Art is always a process that includes many mistakes. I've never seen any purpose in hiding mistakes, unless your work is mainly mistakes. In that case it might be best to hold off for a bit. (After I wrote the last sentence I realized that someone might take it as a really harsh criticism: if you're not successful yet give up and try something new. I guess I should have put a smiley after it. In any case I really don't think anyone would keep going if they didn't have some successes at least in their own mind. Without the feeling of at least partial accomplishment I don't think anyone continues to pursue something - art or otherwise.!) But who would continue on if they only had mistakes and failures? We don't keep on without success. 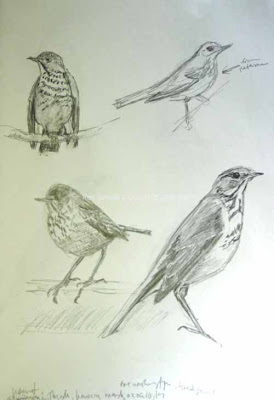 One of the successes of these pages I think is showing the way that the Hermit Thrush slowly raises its tail then lowers it oh so slowly back down. 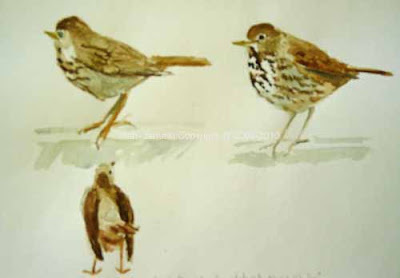 it is a diagnostic movement among the thrushes. When it does so the wings stand out as extraordinarily long. It's a striking pose and I've shown it both as a sketch and as a watercolor. When you see this, especially if the tail is redder than the rest of the body, you know that you're seeing a Hermit Thrush. There are thousands and probably hundreds of thousands of blogs that are full of photos, some ordinary, some extraordinary. But I very consciously try to avoid them and present something more unusual, like drawings and paintings. Nonetheless I don't always have time to render an interesting scene in pencil or paint. Today we're finishing the dig-out of our second 2 foot plus snowfall this winter. 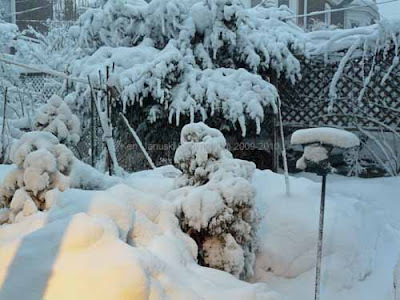 The accompanying photos show our backyard. The 3 foot drift on one of our lawn chairs gives you some idea of the size of the drifts. The other photo shows even taller drifts though they might be hard to see. The clean bird feeder and paths through the snow are thanks to my wife Jerene who is always quick out the door to take care of local animals. In any case I realize that not all readers of this blog are currently living in wintry areas. So for those who actually miss snow I offer these photos. I should add that I love snow myself. It is a bit of a pain in the city but that's a small price to pay for the beauty that it brings to a landscape, not to mention the quiet it brings to a landscape, something always quite rare in a large city. I'd love to include some bird photos or paintings but they've been rare. I think the combination of tree loss in our neighborhood and an increase in the number of our neighbors who feed birds has lowered our number. Normally we'd see some unusual birds in weather like this. But this hasn't happened for a number of years. I was however treated to some blue jays while digging out my car. Perhaps later some birds will present themselves as subjects. But for now these will have to do as illustration of Huge Snow Number Two. 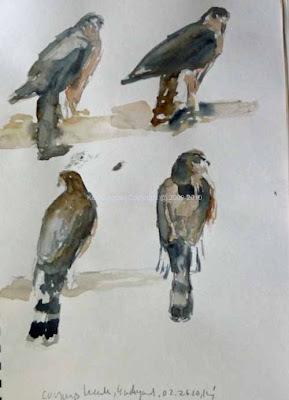 Thanks to all the artists at the 'Wildlife Art' section of birdforum.net for their advice on how to finish this. Most of the advice was 'don't fiddle' and make any changes in a new painting. That was very good advice. I've made a number of small changes that I think have improved this. But I've kept them small and I think that was a good idea. Especially with watercolor it's easy to overwork the painting and kill it. Better to save any changes for a new painting. My guess is that learning this is one of the steps on the way to becoming a mature artist. At least for me there is a tendency to rush into the painting and make changes without thinking of the consequences. And of course I'm not alone. Famous artists of the past were known for going into an exhibiition and changing the painting hanging on the wall. I believe that Delacroix was famous for this though I could be wrong. This is my first developed work on good watercolor paper in months. I hope to continue doing more. As I said in last post these beautiful cranes were seen at Horicon Marsh in Wisconsin last fall. What a treat to be able to see them!